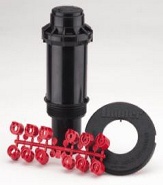 We stock all the standard series and patterns of the Match Precipitation Rate (MPR) Nozzles: 5', 8', 10', 12' & 15'. 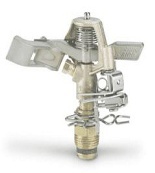 In addition, we also have the U-Series (uniform or undercut), Varible Arc (VAN) and the Xeriscape pressure compensating nozzles.All nozzles are sold separately from the sprinkler body. U-Series: 8', 10', 12', 15' in available patterns Quarter, Third, Half, TT, TQ, Full. Varible Arc Nozzles (VAN): 4', 6', 8', 10', 12', & 15'. XPCN pressure compensating nozzles: Quarter, Half & Full patterns, adjustable distance 2.5' or 4'. 2", 3", 4", 6", 12" pop up height. Some models have built in check valve for low head drainage. Rotary nozzles will thread right onto most pop up spray heads. Rain Bird rotary nozzles. R1318 (13' - 18'), R1724 (17' - 24') in fix patterns Q, T, H, TT, TQ & F.
Rotary nozzles are also great for large shrub areas and hillsides. 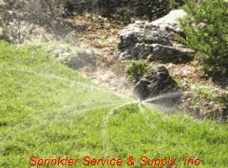 Rain Bird 3500, 1/2" inlet, 17' - 35' distance. Hunter PGJ-04, 1/2" inlet, 17' - 35' distance. Rain Bird 5004, 3/4" inlet, full or part circle, 25' - 47'. Hunter PGP-04 Ultra, 3/4" inlet, full or part circle, 22' - 50'. Rain Bird 5505, 3/4" inlet, 33' - 40' distance, ea. head is both part or full circle, available in stainless steel sleeve. Hunter I-20-04, 3/4" inlet, 23' - 42' distance, ea. head has internal flow stop valve, available in stainless steel sleeve. We also stock several models of 1" inlet commercial rotors from both Rain Bird and Hunter. Hunter PGP-ATR converts Rain Bird Mini paw or Maxi paw to gear driven rotor. Rain Bird Maxi Paw, 1/2" & 3/4" inlet, 30' - 40' distance, interchangeable nozzle for low angle to high flow. Rain Bird Maxi Bird, 1/2" inlet, 30' - 40' distance, interchangeable nozzles for low angle to high flow. Brass Impacts 1/2", 3/4" & 1" inlets, full and part circle available.